Today's Time Travel story "Nightmare Romance!" comes from 1951 -- before the comic book industry started to self-regulate with the Comics Magazine Association of America's Comics Code Authority. As such, this story from Avon's Romantic Love #7 (September/October 1951) with art by Marion Sitton, is quite scandalous! No slumber parties or football games here! We are introduced to Fran Edwards as she heals in a hospital, complete with a guard outside her door. She reminisces for us on what got her in the whole mess in the first place. As the proprietor of a successful modeling agency, she was looking for a man to assist with the agency job placements. 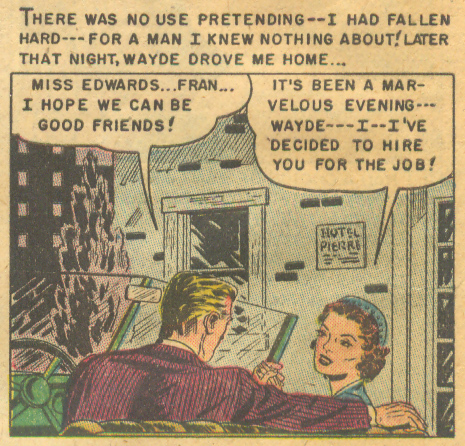 Fran ends up hiring Wayde Hanley -- a handsome and smooth talking applicant. Fran quickly falls head over heels in love with him. Wayde seems to be doing a swell job at the agency, until he starts bringing "younger and cruder" girls in to model -- Gloria Porter being one of them. Fran starts to get suspicious of Wayde's intentions when one of the models mysteriously disappears. Wayde admits to running a scheme to steal money from businessmen with the aid of Gloria and the other model recruits. If the models asked to participate refuse, they are quickly done away with. At first, Fran wants to go to the police, but Wayde convinces her to keep quiet and the rewards will be theirs to reap. She agrees, but is shaken when the agency auditor finds severe and purposeful errors on their tax returns. Wayde tries to smooth things over, but Fran insists they give the scheme up. Wayde promises they only need to do a few more jobs. One evening, Fran heads back to the office after hours to finish up some work. She is shocked to find Gloria and Wayde engaged in an embrace with Gloria suggesting they poison her. Fran realizes what a fool she has been to go along with things and decides she must go to the police. The District Attorney decides to send Officer Mary Nichols undercover as one of the "party girls." After two weeks of infiltration, Officer Mary is finally assigned to attend a party for a group of wealthy cattlemen. Wayde promises her there will be at least $1000 in it for each of the girls. The party ensues and Wayde and Fran wait anxiously at her apartment. Suddenly, the phone rings. Gloria frantically tells Wayde that Mary was an undercover cop and Fran knew all along. Gloria manages to escape during the raid, and heads over to Fran's -- just in time to stop Wayde from beating the pulp out of her. Suddenly, Officer Mary bursts onto the scene. Wayde produces a gun and tries to shoot the lady cop, but Fran flies in front of her and takes the shot. As Fran crumples to the ground, two other officers appear and shoot and kill Wayde. Gloria is carted off and Officer Mary is thankful that Fran saved her life. Relieved the ordeal is over, Fran is happy to repent for her sins of lust and passion. As she waits in the ambulance, Fran asks for God's forgiveness. Pretty crazy story, no?! Party girls, guns, and cleavage, oh my! Very different from the romance comic book stories of the 1960s and '70s! Which do you prefer? The wide-eyed innocence of the post-Code period or stories à la "Nightmare Romance! "?